Burning Life 2009 is coming up from October 17-25. I'm very excited to note that there's at least eight plots being worked on by kids, each of which is unique and wonderful. In looking at all the things being built, this will be a great year overall for kids to come out to the virtual playa and enjoy the goings on. Burning Life is not a "role play" area, though it tends to fall into a certain level of role play naturally. It is set in a desert environment, and people are encouraged to treat the location as if it was the First Life Burning Man's location of Black Rock City, NV. As such, when you enter the event, you are greeted by folks at an entrance much like the one you'd be greeted at in Burning Man, etc. The RL event also has a sizable number of kids and families present at the "KidsVille" camp. You can see some of their world at http://www.blackrockkids.org/. 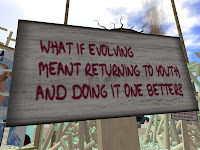 My own entry (created with the advice and prims of Pygar Bu, Robin Howe, Valla Griffin, and Johnathon Spad) is Inner Child Camp 2009. It takes a lot of designs and ideas from the "KidsVille" camp mentioned above. There's a lot of stuff there, including a small shaded area for stories, chilling or whatever and a stage area for shows an stuff. Now is probably a good time to mention that I am looking for kids who want to make use of the space during the event, for shows, acts, or whatever. I'm sure that the other kid-themed camps and art spaces will also want good folks to DJ, perform, and do stuff as well. No shortage of venues this time! As the event comes closer, I will be distributing a HUD to those on the playa, allowing them to quickly and easily find the kid builds and other points of interest. Even then, take the time to really get out there and explore all 34 regions. 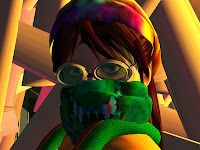 I recommend starting in Burning Life- Deep Hole at the "What is Burning Life?" area, and following it through to the main entrance. When visiting, I recommend dressing for the site. Wear clothes you (or your parents) would not mind seeing get dirty on the desert -- or dress up in something for the fun of it. You'll see both on our RL counterparts. Also, consider some goggles, a hat, and even a bandana for your face. The latter can be gotten free on site, including at Inner Child Camp. I'll be passing out some "Dusty foot prints" and an "Inner Child bracelet" (similar to the KidsVille bracelets all under-agers were on the First Life Playa) on the SLC group. Anyway, I think you'll love what you'll see here at all the camps, including those being made by some of our talented an wonderful SL kid builders an stuff.